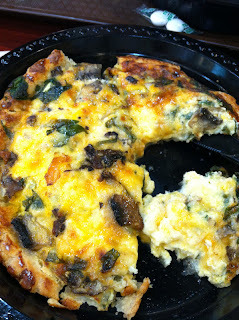 The day before taking my 8 hour Megabus ride for a visit back home, hubby and I grabbed some quick quiche (ha, get it?) at a deli. 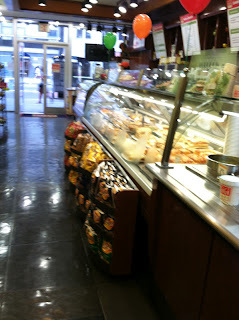 It was one of the most typical delis you could find in the city, albeit quite clean. The floor and window displayers were all super shiny. There weren't that many customers (we and another person were the only ones in fact), so we were greeted by all the employers, who were pretty friendly. 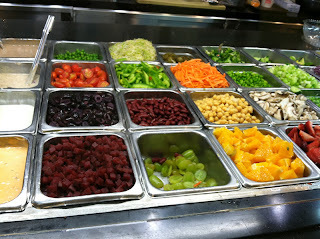 They have an extensive salad bar selection, everything from chives to radishes to pistachios. 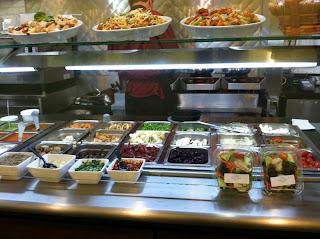 They also have a nice pasta/stir-fry selection cooked right in front you. I asked the chef if the display dishes were real, and to my surprise they actually said yes. But I guess you can't eat it after a day of gathering dust and grease. 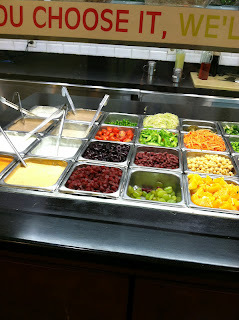 Here's another look at that amazing salad bar, located all the way at the back. 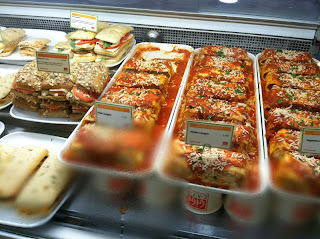 Did I mention they have an awesome selection of lasagna and paninis? These all look pretty delish, but not sure how fresh they are having been in the fridge all day. I got a mushroom and spinach quiche, which was packed in a plastic package around the counter. It was $5 for a huge pie! 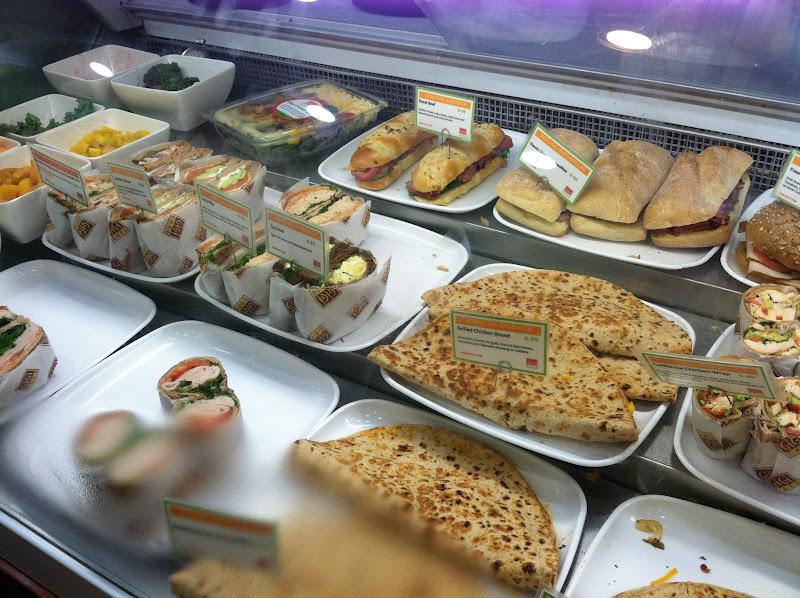 You just grab the one you want and they'll heat it up for you. It was pretty good for the first couple of bites. Hot off the oven, it was soft like egg tart. 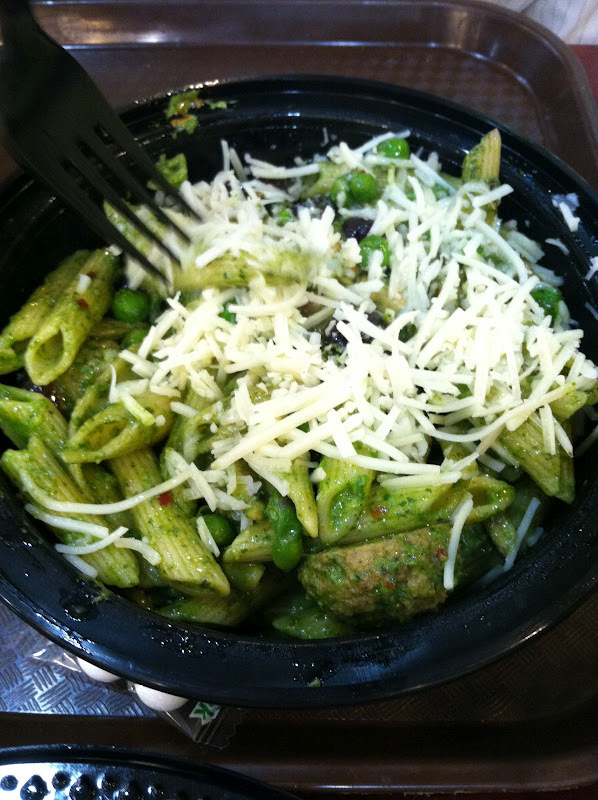 I really liked the bits of mushroom and spinach scattered around like islands in the ocean. But soon the egginess kicks in, and you're left wandering how in the world you are to finish this giant egg pie. That and the fact that we were eating at 5pm. Not recommended unless you just had a huge workout. 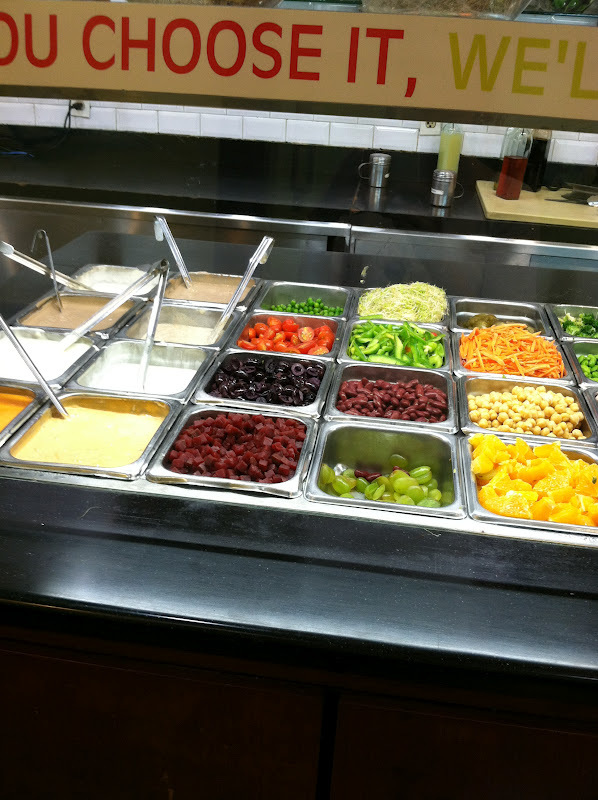 It was also kind of bland without much seasoning. Hubby on the other hand was a bit smart and ordered some penne pasta with pesto sauce. 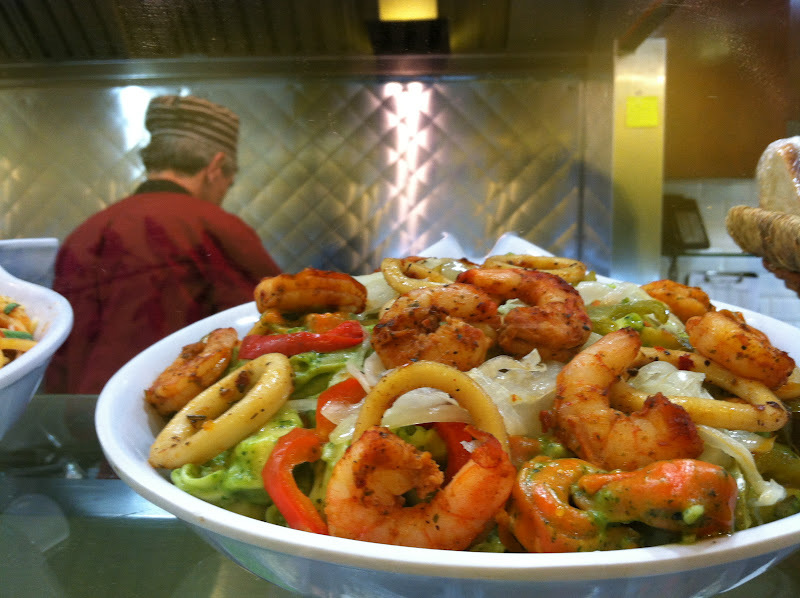 It was cooked in front of your eyes, with the peppery green sauce and green peas and a generous helping of parmesan sprinkled on top. It was actually pretty good, but I probably wouldn't pay $7 for a bowl of pasta that I could reproduce at home for much cheaper. Somehow, I managed to finish my quiche. Perhaps it was thanks to the 5 packets of ketchup I squirted over it to give it some flavor. Hubby helped by finishing a quarter of it. In the time we were there, there were two regulars who got giant bowls of salad. I shoulda went for the greens I guess. But this meal is enough to last you until well into the wee hours of the morning when I woke up in Canada.